Identification: This species has a translucent white body decorated with varying amounts of opaque white which can form either a reticulate pattern or be concentrated and give the animal a more solid white appearance. In either case, there are several medium-sized translucent spots on either side of the mid-dorsal area and randomly shaped translucent areas just inside the mantle margin and behind the rhinophores. The mantle margin is sometimes edged in pale gold or pink and there are sometimes small gold flecks on the notum. The rhinophores and gills range from translucent white to light gold and the posterior portion of the foot extends well beyond the margin of the notum. Distribution: Big Island, Maui, Lanai, Oahu and Niihau: also known from the Marshall Islands, French Polynesia and southern Japan. Taxonomic notes: This species is pictured in Bertsch and Johnson, 1981 (small animal on page 45) and was first recorded in Hawaii by Scott Johnson. Photo: PF: 16 mm: off Makena, Maui; Sept. 3, 1989. 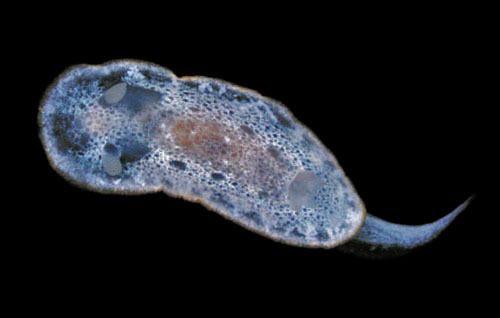 Note 1: Egg masses that are flattened (i. e., composed of a ribbon attached to the substrate by its side rather than its edge) and that lack extra-capsular yolk are characteristic of the genus Chromodoris. This contrasts with the genus Goniobranchus in which the ribbon is attached by its edge and extra-capsular yolk is present. So, Scott's observation supports placing it in this genus.